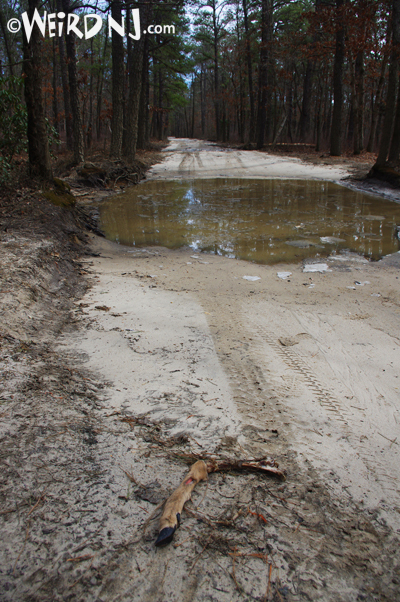 In the town of Atco, there is a road that was never finished. 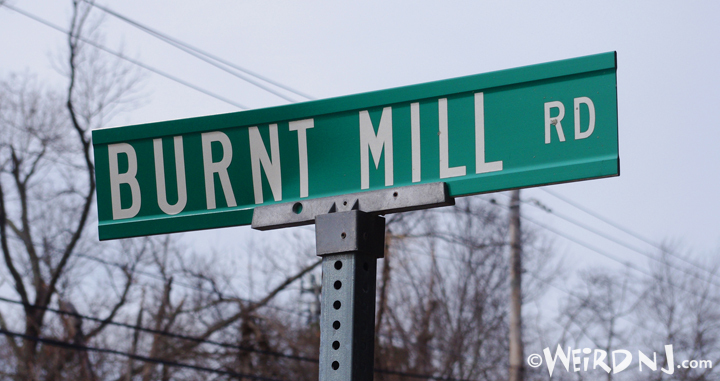 It branches off a road that connects with Rt 30. 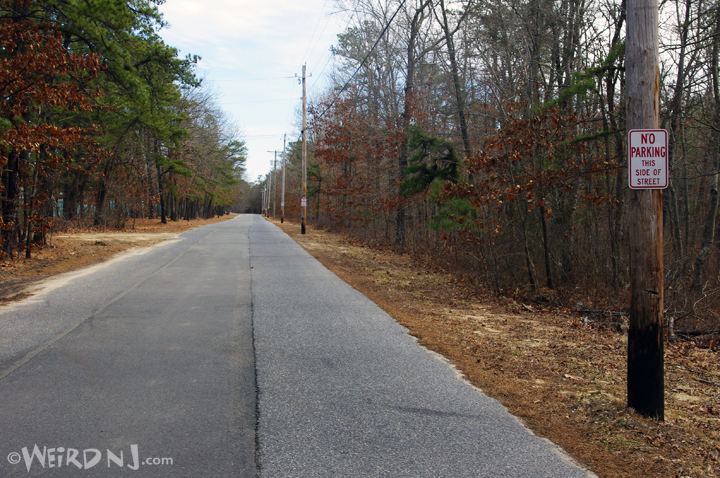 This road runs about two miles before it ends in the Pine Barrens. It was Christmas night and a boy was out playing with the basketball he got as a present when a drunk driver came speeding down this dead end street. He hit the boy and decided to run––only to come to the end of the road. The driver was forced to do a u-turn and drive back, passing the body of the boy he had just killed. Down a road in Atco there is a house where a little boy was playing with a ball in the yard. He chased it into the street, where he was hit by a car and killed. It is a ritual of passage to go and try to see the boy’s ghost. You should go at midnight, and park in a specific spot and flash your lights at the area in the road across from the house. An image of the dead boy is supposed to be seen chasing the ball into the street with headlights coming at him. Many have said they see different scenes but they are all related, most of them having a little boy and headlights. In my own personal experience, an image of boy did walk towards our car, but never actually made it. It was as though he was walking in place. Nevertheless, I was scared out of my wits. I’ve seen the Atco Ghost! There is a dead-end street in Atco that has been haunted for years. At the end of the road there is some type of factory from which large trucks often leave around dusk. One night, there was a little kid bouncing a ball all over the street. As one of the trucks was leaving the plant, the ball took a bad bounce and the boy ran after it––right into the path of the oncoming truck. Rumors started to circulate that the boy’s ghost comes back to play in the same street that he was killed on. Growing up in Atco, I spent many nights drinking beer with friends at the end of this street and waiting for the ghost. We never seemed to find him whenever we gathered there. The only time I ever had a different experience there was when I actually followed the instructions on how to see the ghost. The night was rather misty and it was raining a little bit. My friend and I drove to the end of the road where the factory is located and turned around. We drove up to the second streetlight and stopped the car. I turned off the ignition and we sat in silence for a while. Nothing was happening, so we decided to leave. The moment I touched the keys, a sudden wind swirled the mist on the road, and a shadowy shape appeared at the side of the road. It wasn’t a shape really, but a break in the low-lying fog that resembled the outline of a small child. We decided to get out of there. As I was racing down the street, I could see the fog swirling faster and faster. We came to the stop sign, which I ignored, and I turned left onto the main street. 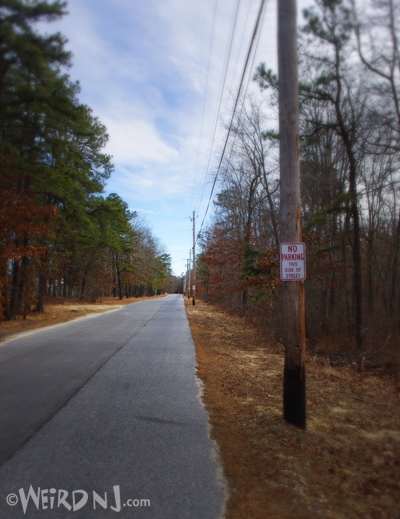 –Zachary W.
Located not far off the White Horse Pike, the Atco Ghost is a popular local legend that is surrounded by a plethora of lore and rumor. A few months ago, I decided to learn more about this creepy resident of my neighborhood. My mother, who has lived in the area for over 55 years, seemed a logical place to turn. She explained that it is supposedly the ghost of a local youth who was killed in the ’50s during a drag racing accident. The unfortunate youngster chased after a loose ball that rolled into the path of the oncoming hot-rods and though he did not survive, his spirit lives on and became a source of interest in the area. As the tradition prescribes, interested visitors should travel the dark and isolated road where the accident happened until they reach the end. Once there, they are to turn their vehicles around so as to imitate a car about to begin a drag race and flash their headlights three times (a custom used to start a drag race). After this it is important to focus your eyes on the distant lampposts, where you will notice a small figure walking across the road in chase of his lost ball. My sister told me that she had once seen the boy walking across the road and a friend of mine described a much more startling experience that his ex-roommate had. Supposedly, he didn’t see the boy in the distance, but instead noticed him sitting next to the car he was occupying. He said the boy looked pale white and sat in silence, and upon seeing him, he freaked out and came home crying. (It should be noted that this was a grown man who swears he was not under the influence of any drugs). Bored around the week of Halloween, my friends and I decided that this was a perfect pretext for paying our local ghost a visit. We drove back, flicked our lights, and sat for awhile. We were terrified but saw nothing. Dejected, we decided to head home, but that’s when the real fun started. We noticed other like-minded individuals driving down the road and quickly realized that they did not see us. Seeing a perfect opportunity for some chicanery, we turned our lights off and drove back down the road with the intention of throwing on our high beams when they flashed their headlights. We weren’t driving for more than a minute when the event occurred. After putting ourselves in the position of being frightened victims, we felt a sense of heightened control by becoming purveyors of fear on the unsuspecting youths. But just like in any good horror film, the tables were about to be turned again. Out of nowhere, a blinding light appeared in our rear view mirrors and we all screamed in terror. The initial flash was followed by an array of other blue and red lights. We received no ticket, and though we are sure that this event was only the product of local resident’s frustrations against people wandering into their neighborhood, we’d like to believe that this was just another small trick perpetrated by a long departed child with a good sense of humor.